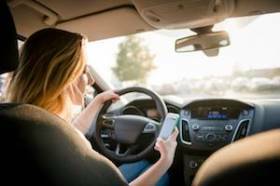 A recent study conducted by the Insurance Institute for Highway Safety (IIHS) found that phone use by drivers, such as texting, browsing the internet, and selecting song choices, has risen dramatically over the past few years. In the four-year span from 2014 to 2018, the number of people observed using their phones while driving rose by a staggering 57%. Distracted driving can be especially dangerous in urban and suburban areas. In the greater Chicago area, texting while driving and other types of distractions can put everyone at risk. If you or a loved one have been injured in a car accident that was caused by distracted driving, you should work with an attorney to pursue compensation from the negligent driver. As smartphone capabilities increase and people use their devices more and more often, drivers become tempted to use their phones while on the road, and this has led to the dramatic increase in distracted driving collisions throughout the United States. According to statistics compiled by the National Highway Traffic Safety Administration (NHTSA), more than 390,000 Americans were severely injured in car accidents caused by distracted driving in 2015, and approximately 3,450 people were killed due to the reckless actions of distracted drivers in 2016. Every single year, as many as 2.3 million Americans are sent to the emergency room after suffering injuries in a motor vehicle collision. According to the Centers for Disease Control and Prevention (CDC), car accidents cost Americans approximately $44 billion every year in terms of both medical expenses and lost income. Those who have been injured in a motor vehicle collision should understand their legal options for recovering compensation from the negligent driver who caused their injuries. Driving at Excessive Speeds: According to statistics compiled by the National Highway Traffic Safety Administration (NHTSA), 9,717 Americans were killed in car accidents caused by speeding drivers in 2017. Speeding impacts a driver’s ability to brake, change directions, and react to changes in traffic flow. If you notice a driver traveling at excessive speeds, keep a safe distance away from them. Drinking and Driving: Intoxicated driving is another common form of driver negligence. Despite increased traffic surveillance and substantial criminal punishment, thousands of Americans choose to drive under the influence of alcohol, drugs, or other intoxicating substances. Common signs of a drunk driver include swerving, recklessly passing, and driving at sporadic speeds. Recognizing these signs and reporting them to local law enforcement can save lives. Distracted Driving: The past several years have seen an incredible rise in cell phone use while driving. Throughout 2016, distracted driving claimed over 3,400 lives, and this form of negligence accounts for around 25% of all motor vehicle collisions throughout the United States. While mobile phone use is the most common form of distracted driving, other common distractions include eating or drinking while driving, having conversations with passengers, or any other action that takes one’s eyes off the road or hands off the wheel of the vehicle. Car accident injuries can result in costly medical bills, expensive physical therapy, and loss of work hours during recovery. At Flaherty Law, we are dedicated to ensuring that our clients receive the full compensation they deserve after suffering car accident injuries. With years of legal experience, we are confident in our ability to aggressively represent you and help you receive the financial support you need and deserve. To schedule a complimentary consultation with a Will County personal injury attorney, call our office today at 815-577-7500. By now, all drivers should be aware of the dangers of distracted driving. According to the Illinois State Police, distracted driving is present in more than one million car accidents every year in North America. The economic impact of these accidents reaches nearly $40 billion annually, some experts estimate.